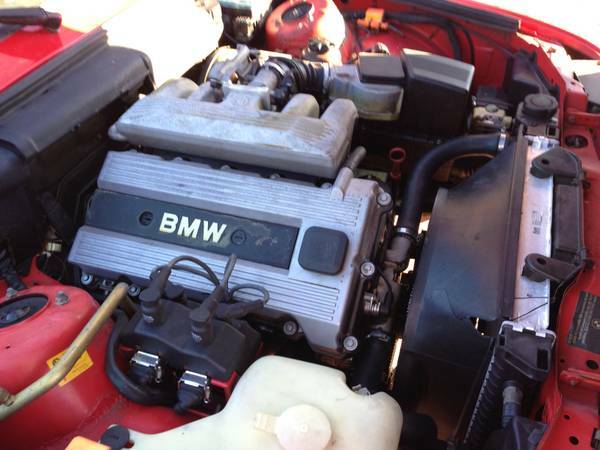 You can easily find E30 BMWs under $4000, but most often they’re poorly modified, banged up, high mileage, or a combination of those. 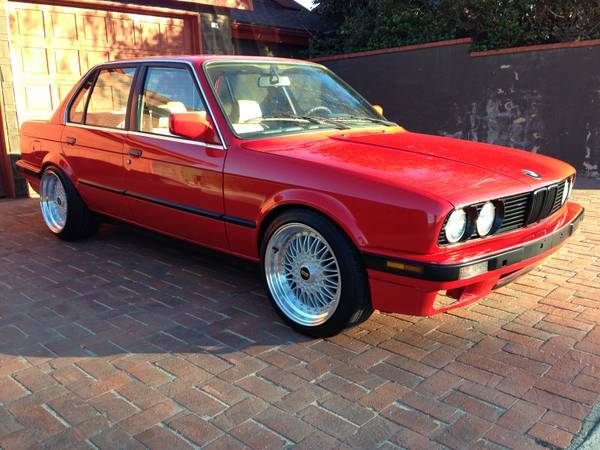 It’s also harder to find affordable E30s with manual transmission, particularly in the 4-door version. And sure, 4-doors aren’t the coolest, but when you’re trying to spread the classic sporty-car gospel, you gotta have enough doors to give your friends easy access. Because like it or not, even the last of the E30 BMWs are now 22 years old! Sure, with electronic fuel injection, air conditioning, and electrical stuff (what? you can push a button and the window goes down?! ), they don’t feel old, but the clock doesn’t stop ticking. 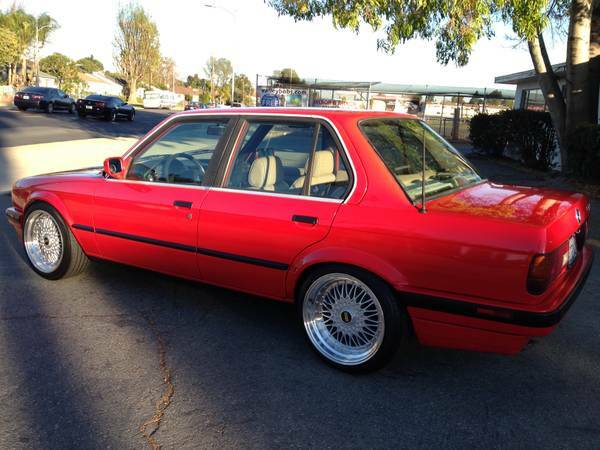 You can find this 1991 BMW 318i for sale for $3900 in Encino, CA. Okay, so this one is a high-mile car, at 300,000. But it’s had new paint, a rebuilt engine and newer tires, clutch, and brakes. The car is also said to pass smog, and of course you’ll have to do it again on transfer of ownership. Red on tan is a classic combination, and works much better than the bronzit (that’s how you say Corolla gold in German), white, or gray these cars are often painted. Oops, looks like we lost the bottom lip of the airdam. It’s a common affliction with the late small-bumper E30s – is this a hard part to obtain? There’s not a lot between this car and a truly nice example, but that detail would help a lot. The wheels look really good on the car, although their width must take away from the sharpness of the handling of this car, which would have normally had 195/65 R14 tires. Tidy engine bay speaks to a well-kept car. It’s not polished to death, but doesn’t show a lot of dust or oil. While the seller does not say how many miles have accumulated since the rebuild, a well-maintained E30 should be able to handle Volvo-like levels of mileage. 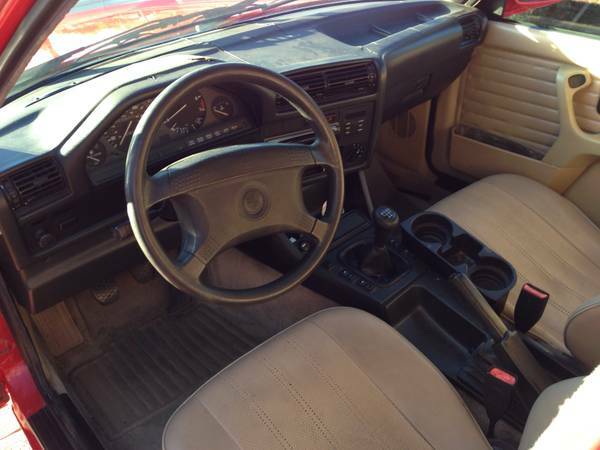 Even the interior looks well-kept, with a surprising lack of splits or tears in the upholstery. The dash does show some cracking, and the seats could probably use a good cleaning, but on a base car these are probably the BMW factory vinyl, which is apparently quite durable. The tan carpets need cleaning too – what gave car manufacturers the idea beige would survive that kind of environment well? That add-on cupholder is hideous, but if you lived with LA-area traffic, you’d probably have a cupholder too. On the bright side, the seller is close to Mulholland, so your first drive can be on that famous road. This entry was posted on February 2, 2014 at 5:00 am and is filed under Feature. You can follow any responses to this entry through the RSS 2.0 feed. You can leave a response, or trackback from your own site. I don’t care for the wheels at all; it gives the car a Pep Boys tuner vibe in my opinion. $4K seems kind of steep for this.